In November 2006, the city of Kissimmee, Fla., a working-class community of 61,000 in the shadow of Walt Disney World, seemed poised for a seismic shift in local government. Three Latino candidates — in a city with a 51 percent Latino population — vied for separate seats on a five-person City Commission long dominated by white non-Hispanics. In the end, only one prevailed. "The Hispanics just didn’t come out to vote," laments Carlos Irizarry, the lone winner, now in his first term. "Hispanics tell me they don&apos;t understand the process; they say they don&apos;t know the issues, that it&apos;s too difficult to vote, that they need the day off (to vote). "I wish I really knew the answer." Irizarry is not alone. Across the country, Latino candidates, community activists and party organizers struggle with an enduring truth: Latinos are less likely to vote than other racial and ethnic groups. In 2006, just 54 percent of voting-eligible Latinos in the U.S. were registered, reports the Pew Hispanic Center, compared to 61 percent among blacks and 71 percent among whites. And those Latinos who do register are less likely to vote, with 60 percent casting a ballot in 2006 compared to 67 percent of registered blacks and 72 percent of whites. The disparities are not new. Low voter registration and turnout weakens the voice of the nation&apos;s fastest-growing racial or ethnic group, Latino activists say. With the Latino population jumping by 5.7 million between 2002 and 2006, the group accounted for nearly half the total population growth in the U.S. Many are not citizens or are too young to vote. But even those who are eligible vote in almost negligible numbers; in 2006, just 13 percent of the total U.S. Latino population cast a ballot. That worries people like Miami&apos;s Claudia Gallegos, a naturalized Guatemalan who takes time off from her medical sales job to help with local campaigns and to drive voters to the polls. "They&apos;re idiots!" she says of fellow Latin American immigrants who choose not to vote. "I tell them that. Why would they want to come here if they&apos;re not going to speak out, make a difference?" Theories abound to explain Latino voting reluctance, simple demographics among them. Across all ethnic groups, voting rates tend to increase with age, education and income — three variables in which the Latino electorate lags the overall population. As the Latino electorate matures and grows more educated and affluent, voting rates should rise. Cultural factors also may be to blame. Gallegos believes many immigrant families arrive from places where civic participation was discouraged by corrupt, repressive governments. "If they don&apos;t vote, it&apos;s easier to stay off the radar," she proposes. Several studies back the argument, including a recent survey by the University of Washington&apos;s Institute for the Study of Ethnicity, Race and Sexuality, which found that nearly half of all Latinos in the U.S. believe "people are better off avoiding contact with government." That distrust is perpetuated, most agree, by candidates who fail to engage Latino voters, ignoring the issues that move them. "Latinos have long had a sense that they are disaffected, that they are not part of the conversation," says Arturo Vargas, executive director of Los Angeles-based National Association of Latino Elected and Appointed Officials, a nonpartisan group. "When they don&apos;t see what&apos;s in it for them, they simply don&apos;t vote." And with campaign dollars tight, candidates pay less attention to groups with poor voting records, like Latinos. "It&apos;s a vicious cycle," Vargas says. "They don&apos;t vote, so candidates ignore them." Research shows that Latinos are more likely to vote not through a sense of civic responsibility or in reaction to broad campaign themes but when they feel a personal connection to the outcome. The immigration reform debate, for example, is expected to generate a record turnout by Latino voters for this year&apos;s presidential election as well as in municipal elections in cities with large Latino populations. That&apos;s the case in this April&apos;s race for Milwaukee city attorney, in which Wisconsin State Rep. Pedro Colón is challenging entrenched incumbent Grant Langley. The Puerto Rican-born Colón, 39, a Democrat who serves a densely populated Latino neighborhood in South Milwaukee, says federal immigration policy is now a key local issue. "The Latino community here is not happy with the immigration dialogue," he says, predicting a high turnout of the city&apos;s Latino electorate. "If [Latino voters] are not completely behind me, I won&apos;t win." Without a hot-button issue, experts say, Latino voters often tune out during local races and referendums, even when Latino candidates are vying for seats, as in Kissimmee&apos;s City Commission elections. "They&apos;re not going to come out and vote just because there&apos;s a Latino name on the ballot," says Colón, who in 1998 became the first Latino elected to the Wisconsin state Legislature. "They came out to support me because I engaged them in a respectful way. I went to every church; I spoke with every neighbor I could. They made the effort to come out and vote for me because I made the effort to reach them, not because I am Latino." Now in his fifth term in the state Assembly, Colón believes he&apos;s found an effective formula for getting out the vote: Identify one or more issues that resonate with Latinos, and then allow those issues to serve as a conduit for meaningful discussion with small groups of residents. It can be a hit-or-miss strategy, he says, with some voters rejecting political segmentation. "You need to speak with them respectfully, intelligently, and recognize that not all [Latino voters] think alike," he explains. "The problem with ethnic politics is that it is inherently condescending." This strategy of thoughtful engagement at the grassroots level, political analysts say, explains an unexpected drift toward the GOP by many Latino voters in the first half of the decade. Despite the Democratic Party&apos;s historic grip on the Latino electorate, President Bush received 44 percent of the Latino vote in 2004, up from 35 percent four years earlier. During that period, party identification surveys of Latinos showed steady gains by the GOP, peaking in mid-2006. GOP insiders attribute an effort launched a decade ago to reach Latino voters at street level. "We did something interesting," explains Danny Vargas, chairman of the Republican National Hispanic Assembly, the Latino outreach arm of the Republican Party. "We went out and knocked on doors, spoke with people one on one. And when we did, many of them realized that our core values as a party were not so different from their own." But those gains were temporary. Despite appointing a Latino — Sen. Mel Martinez of Florida — as general chairman of the Republican National Committee, the GOP has watched its share of Latino voters return to pre-2000 levels. (Martinez resigned in October from the RNC position after less than a year on the job.) Vargas blames the "tone and tenor" of the immigration debate, which found many Republican lawmakers and candidates backing a hard line on border control and illegal immigrants. Linda Chavez, a Reagan-administration official, a one-time U.S. Senate candidate from Maryland and now a conservative commentator, is more blunt: "You can talk about core values all you want, but it&apos;s not going to do any good when you&apos;re saying that people&apos;s friends and family members need to be rounded up and shipped home." Chavez, who raises funds for Republican candidates through a PAC she calls the Latino Alliance, predicts a strong anti-GOP backlash among Latino voters in 2008. NALEO&apos;s Arturo Vargas agrees that immigration concerns coupled with a nationwide voter-outreach campaign will produce record Latino registration and turnout this year. "Maybe this will help us break the cycle," he says. NALEO is coordinating that unprecedented get-out-the-vote drive, which will include phone banking, community outreach and door-to-door canvassing in Latino neighborhoods where voter turnout has been poor. Those efforts coincide with a national public service campaign co-sponsored by NALEO and the Spanish-language media company Univision. In the first 10 months of 2007, the Ya Es Hora, ¡Ciudadanía! (Now It’s Time, Citizenship!) TV spot helped generate 1 million citizenship applications from Latino residents. A second phase of the campaign, encouraging voter registration — Ya Es Hora, ¡Regístrate! (Now It’s Time, Register!) — kicked off late last year. And in January, the network began airing the final installment: Ve y Vota en las Primarias (Get Out and Vote in the Primaries). The efforts appear to be working. 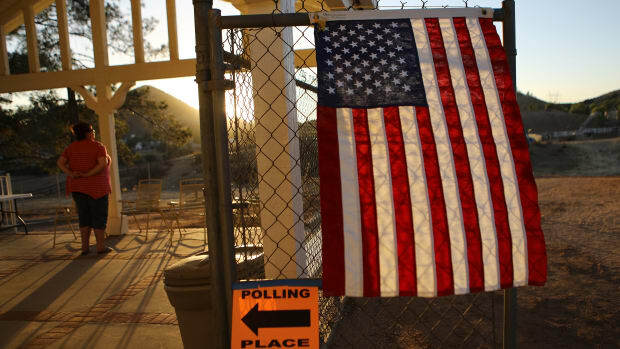 Through the early primary season Latino voter turnout has been high, exit polls show. In California, for example, Latinos accounted for 30 percent of all votes cast in the Democratic primary — nearly twice the share from four years earlier. High Latino turnout could greatly favor the Democratic presidential candidate next fall, says Paul Taylor, acting director of the Pew Hispanic Center. He notes that Latinos constitute a significant portion of the overall electorate in four of the six "swing states" that President Bush carried by five percentage points or fewer in 2004 — Florida, New Mexico, Nevada and Colorado. Whether that potential Democratic edge plays out in November is anybody’s guess. Luis Clemens is editor of Coral Gables, Fla.-based CandidatoUSA, a six-month-old online newsletter of Latino political marketing and voting behavior. He’s tracking a gamut of efforts all across the country to encourage Latino registration and voting. Political strategists from both parties, he says, are watching closely. "When it comes to the Hispanic vote, there&apos;s always been a gulf between potential and reality," Clemens says. "Lord knows there are plenty of people trying to figure out why. 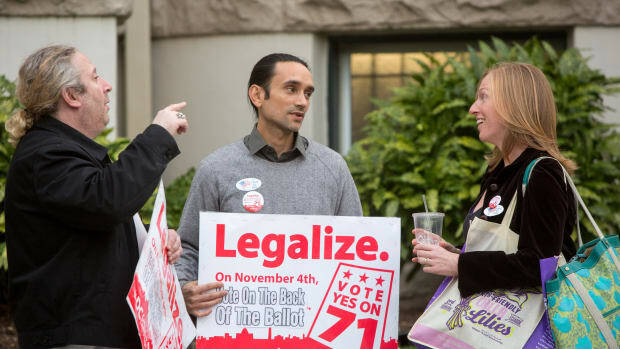 This year may be an experiment of what works and what doesn&apos;t."
In states where ballot initiatives are common, recent studies suggest they foster a low opinion of government leadership.